Destination Imagination, Inc. is excited to announce the appointment of Michele Tuck-Ponder, Esq. as our new Executive Director. In December 2017, Tuck-Ponder was appointed as Destination Imagination’s Interim CEO and has been working closely with the Board of Trustees and staff on a strategic plan for sustainable growth and impact. 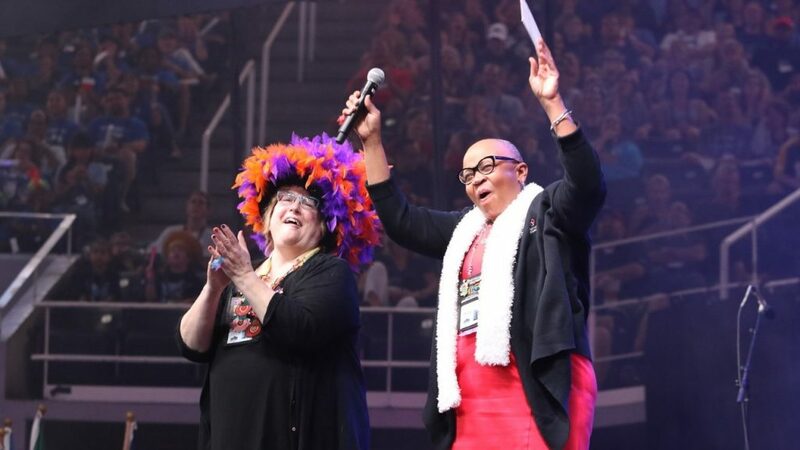 Michele Tuck-Ponder (left) on stage with DI Board of Trustees Chair Emeritus, Pamela Schroeder, at the Global Finals 2018 Welcome Ceremony. Tuck-Ponder is a problem solver with an extensive background working with local and national nonprofits, as well as in politics, government, media relations and public policy. She is the President of Ponder Solutions, providing consulting and advising services for nonprofits in advocacy, governance, strategic planning, building and leadership development. She is a former mayor of Princeton Township and has served as assistant counsel to Governor Jim Florio as well as a congressional aide to former U.S. Representative Louis Stokes and Senator Frank Lautenberg. Tuck-Ponder served as assistant director of the New Jersey Division on Women and the New Jersey Division on Civil Rights. She was the CEO/Executive Director of the Girl Scouts of Delaware-Raritan, Inc. Tuck-Ponder has also served as director of development and public affairs at UMDNJ-Robert Wood Johnson Medical School and as a community builder fellow with the U.S Department of Housing and Urban Development in Camden. Most recently, she was the Associate Director, Career Education, Diversity and Pre Law Programs at Princeton University. Tuck-Ponder is a graduate of the Medill School of Journalism at Northwestern University and the University of Pennsylvania Law School and has also been an instructor at both Rutgers and Princeton Universities. She and her life partner, Rhinold Lamar Ponder, co-authored two books, a collection of sermons on faith and love, published by Random House.